If we look at some of the latest data, that compares the mobile web, with native apps, we can see that the mobile web, clearly has a broader reach, but lacks by a much larger extent on engagement. This seems to be an experience related problem, these days native apps seem to consistently provide better experiences than their web counterparts, with better performance, smoother animations, and fully integrated with the device OS. Why are we failing to deliver the same level of experiences on the mobile web that native apps are able to provide? I believe there are several factors at play: for starters browser vendors have some guilt here, inconsistent browser support and late adoption of API’s don’t make life easy for developers. Other interesting side, is the business side of things, with third party integrations, analytics and ads. Most large company websites have dozens if not hundreds of requests, with ads already accounting to between 18% and 79% of the total data downloaded in mobile devices. On average, 53 third-parties are involved behind the scenes of a page, syncing data, cookies, etc. On the mobile web if we add this up to slow connections, latency and slower cpu’s, a full page refresh on each click, it’s just not going to work. But don’t we have really fast connections now? The latest OpenSignal data, shows that only eight countries in the whole world, are able to provide, on average, an LTE signal 80% of the time, being South korea and Singapore the best from this group. The United States offer great coverage, but average speed, and countries such as the United Kingdom have only 53% of coverage. In this years Google I/O, in a great web performance talk, Ilya Grigorik drilled down, what it looks like to be a mobile user in the UK, today, in terms of network connection. 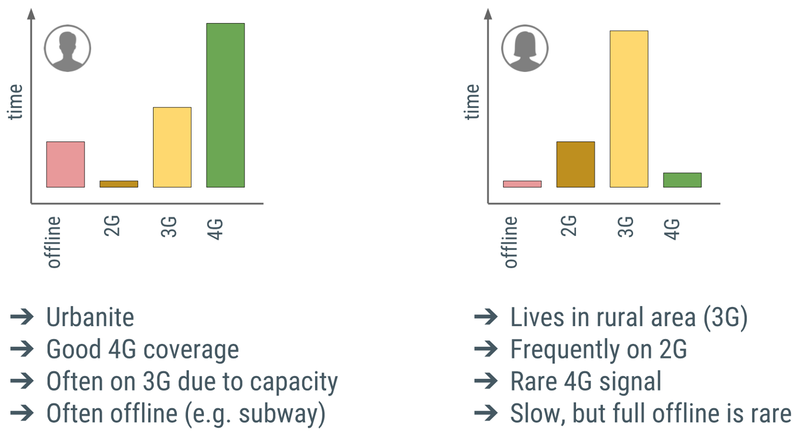 We can see that 30% of the time mobile users have a 2g connection with 50% reliability and are offline 5% of the time. Also he analysed things from a usage perspective, we can see that the offline use case, is much more usual in urban areas. Some more interesting facts about the new mobile world are that: 20% of U.S. households rely only on cellular data, and 60% of all mobile connections worldwide are 2g. Our performance measurement models need to get updated, many companies are still too focused on total page load time as the main performance metric. We need to look at first meaningful paint and time to interactive as our main metrics. These are the ones that have the most impact on user experience. Also runtime performance is still mostly ignored, the fluidity of animations and scroll is of major importance. On an interesting survey conducted in 2014, about what features users want from a news experience, smooth navigation was the first choice with 77.6% of votes. What features do you want from a news experience? Focus on the user; the end goal isn’t to make your site perform fast on any specific device, it’s to ultimately make users happy. Respond to users immediately; acknowledge user input in under 100ms. Render each frame in under 16ms and aim for consistency; users notice ‘jank’. Keep users engaged; deliver interactive content in under 1000ms. AMP and Instant articles, created by two of the biggest online platforms of the moment (Google and Facebook respectively), are a way to bypass curent web performance issues, by providing a closed or restricted environment, where you can create your content, that already has the defaults of web performance done for you. In the launch of instant articles, Facebook stated that, on average, a link to an external website on your newsfeed, takes 8s to load. Is this a statement saying that we as developers can’t do web performance right? Is the future of publishing in this platforms? By the way if you’re on a mobile device good luck reading that article. Apps like Instagram and Vine, provide somewhat limited experiences on the web. Snapchat is a native only platform, using the web only as a landing page. Despite being native only this ecosystems drive huge engagement and generation of content. Why are native apps having so much more engagement? Well for starters mobile is eating the world. In this landscape with unprecedented scale, native apps are a first class citizen, and are front and center in your homescreen. This obviously leads to being a tap away from your favourite content. With, as we’ve seen before, better experiences than the mobile web. Instant apps, announced at this years Google I/O, are a way to link from the web to a native app, without downloading it. You just need to download a part of the app you’ll be using. Android Instant Apps enables Android apps to run instantly, without requiring installation. Instant Apps lets you experience what you love about apps — fast and beautiful user interfaces, high performance, and great capabilities — with just a tap. And universal links are a way to link directly to a web app without going through the web. When you support universal links, iOS 9 users can tap a link to your website and get seamlessly redirected to your installed app without going through Safari. So these are the ways, that the two biggest mobile operative systems in the world, that completely dominate the market, are bypassing the web for native apps. As new and more powerful mobile devices, such as the Ipad Pro, enter the market and evolve, will they be able to replace desktops? Their operative systems are getting more and more powerful, and able to do the kind of work you do on your desktop. Also in terms of performance they are getting pretty close to desktop machines. If this devices take over and replace desktops, with native apps as first class citizens, technologies such as instant apps and universal links, what will happen to the web? Will websites still be able to survive? The Web platform ability to reach millions of users, still seems to be it’s major advantage over the native platform. Despite all the problems we’ve seen, the average website is still smaller in size than most apps. Will the web become the main vehicle of interaction with the digital world in developing countries where data is still really expensive? And will native apps become, the main vehicle of interaction with the digital world in developed countries, where most people can afford better data plans? Google Chrome developers seem to have spotted these issues, and are trying to fight back, by investing heavily in new API’s for the web, and in educating developers about performance. Progressive web apps seem to be the the future of apps on the web, and the set of principles they bring, the de facto standard for great experiences. These new web experiences seem to be doing well on developing countries judging by the case studies published. Only the future will tell if the web will become just a thing for developing countries, or will it be a first class citizen on all mobile devices.